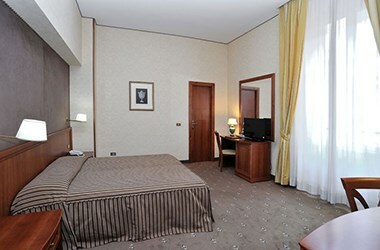 In classic style, the rooms at Hotel Virgilio in Rome are all very comfortable. Comfortable and welcoming ambiences are married with functional services that include Wi-Fi, satellite LCD TV and a safe. For a relaxing sense of wellbeing: while the wood used as decoration warms the atmosphere, the adjustable air conditioningmakes our rooms pleasant year-round. 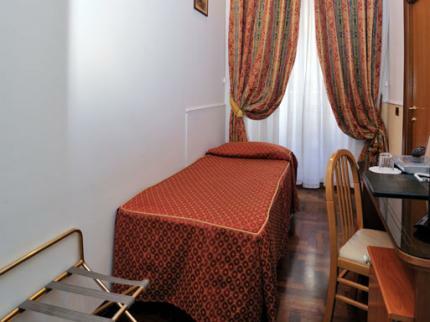 The rooms at Hotel Virgilio in Rome offer various solutions for a comfortable stay: from convenient single rooms to spacious Familysuites, our rooms are just right for everyone. The bathrooms come with showers and hairdryers. A room just for you. 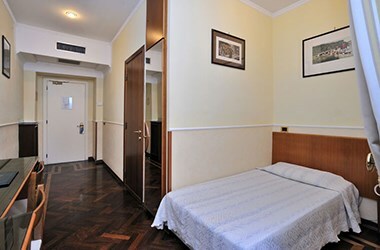 Warmly decorated, air-conditioned room is equipped with satellite TV and a private bathroom. Room facilities: minibar, safe, direct dial telephone, air conditioning, hairdryer, writing desk, iron & ironing board (on request), flat screen TV with satellite channels. Easy, convenient with a full-size bed. 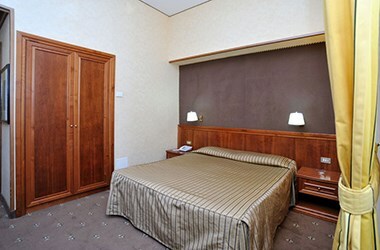 This air-conditioned room is smaller than the classic double, with a French bed, satellite TV and private bathroom. 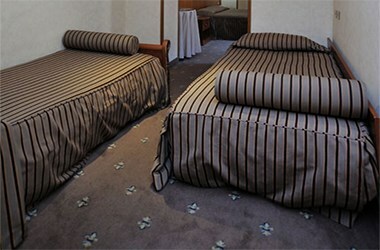 Cots or extra beds can not be accommodated. Room facilities: minibar, safe, telephone, air conditioning, hairdryer, writing desk, iron & ironing board (on request), flat screen TV with SAT channels. Can be requested with a double bed or twin beds. Room facilities: Minibar, Safety Deposit Box, Telephone, Air Conditioning, Hairdryer, Desk, Ironing Facilities, Heating, Bath or Shower, Flat-screen TV with SAT channels. 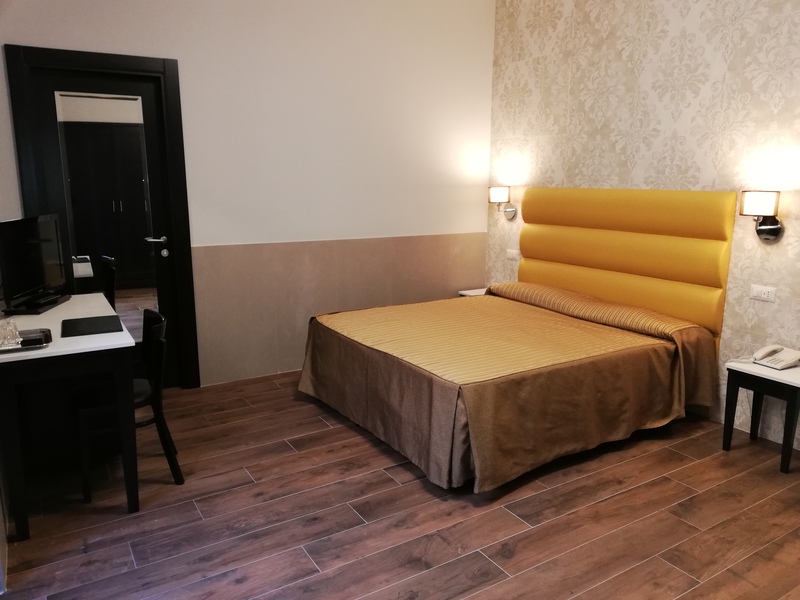 In a harmonious and relaxing atmosphere, furnished in a modern style the superior rooms are larger in size than the others; all have flat screen LCD satellite TV, safe, courtesy line, telephone in room, minibar and free WI-FI internet connection. 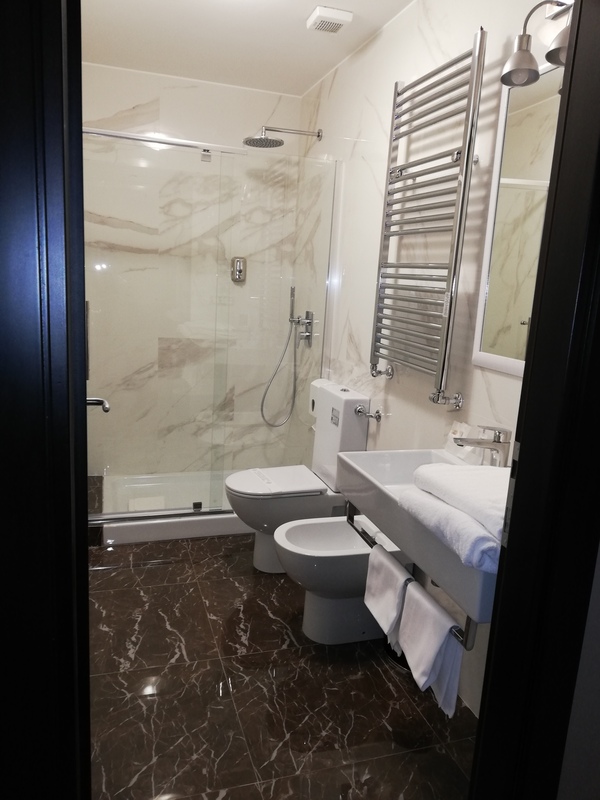 The bathroom is modern and elegant and has a large shower. To be shared with friends, colleagues and family. Characterized by warm colors and wood furniture, this air-conditioned room is equipped with satellite TV and a private bathroom. Room facilities: Minibar, Safety Deposit Box, Telephone, Air Conditioning, Hairdryer, Desk, Ironing Facilities, Heating, Satellite Channels, Bath or Shower, Flat-screen TV, Wake Up Service. We'll do everything to make you comfortable. This air-conditioned room features a satellite TV and private bathroom. If arriving early, we will do our best to accommodate you as soon as possible, otherwise we can store your luggage in our free deposit so that you will be free to enjoy the city immediately. At your return you will find your luggage waiting in your room. Possibility to "late check out" upon request and subject to availability.